Notice Osho's unique penmanship, placing the pen between his index and middle fingers. We have heard that Osho never wrote, as the whole bulk of published discourses delivered by him throughout the years in Bombay, Poona and Oregon are all transcriptions of his talks from the recorded audio tapes. So these discourse books were in fact never written, but spoken verbatim without any manuscript, and only sutras and jokes were written on the notepad he held in his lap. 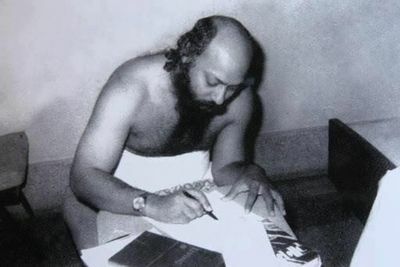 The "He-never-wrote" myth has throughout the years been put forward wholeheartedly by sannyasins and researchers alike, whose perspective has been limited to the Poona One phase and maybe to Bombay, but definitely not to Osho's time in Jabalpur, where he stayed for twenty years and where the foundation stones - also in handwriting - to his whole vision were carefully laid out. We will thoroughly have to puncture this myth as plenty of letters, manuscripts and articles are preserved from his hand. Even from Poona One some handwritten notes have been presented to disciples, e.g. to Somendra for his editing of Osho's books. But in Jabalpur he was writing his manuscripts for his first lectures and for his upcoming articles as well. Letters he had already been writing in numbers for years as we have seen, later to be published in many Hindi books and A Cup of Tea. Now he started writing his notes and drafts for lectures on his new Olympia typewriter, but soon he gave up on this and left it to Arvind to do the typewriting from his written notes, for his lectures as well as for the following publishing of his booklets. So from the first he was in fact using some written support also for his early lectures, until he came to the point during the 1960s where he was to deliver them extemporaneously. No manuscripts for articles or public lectures are to be found after 1968 as they were by now recorded on tapes. Keeping quite a few of his friends and later sannyasins busy, transcribing his talks and preparing them for editing and publishing. "During field work in India I visited many old sannyasins who could tell many tales from the early days of Osho's life. They were interviewed and their collection of booklets and paraphernalia documented and photographed. Among those visited was also Osho's secretary in Jabalpur, Arvind Kumar Jain, member of the family as Osho was his first cousin and his maternal uncle's eldest son. During the interview he showed me the manuscripts given to him by Acharya Rajneesh when he left for Bombay in 1970. Then followed a snail mail correspondence for five years until a common understanding of the terms of the exchange was agreed upon in 2005 and I then revisited Arvind Kumar Jain in Jabalpur. The total exchange also consisted of numerous other items from their years in Jabalpur, early pamphlets and booklets, photos, diaries, his typewriter with Hindi keyboard and even Osho's name plate from the gate to his residence in Jabalpur. All manuscripts and other items are now kept in a secure box in Europe. And, as we might expect in India, things are not always what they look like. After discussing the situation with some friends, Arvind Kumar suddenly had second thoughts about the whole thing, and he was no longer capable of fulfilling our agreement. Right there I felt blessed with experiences from years in India and how to adapt to almost anything. So after a bit of patience, wrestling and some more patience we ended up signing an officially stamped document at the office of the local notary public, finalizing the whole matter. I thought. But more was to come, and this document turned out later to be most useful. Anyway, those who might want to know Osho's feeling about his secretary just have to listen to his discourses or have a look into the Osho Source Book where more context is to be found." The origin of the paper is from Orient Paper Mill, Amlai, India. It is 'Foolscap' size paper, in the dimensions 13 by 8 inches (330 x 203 mm), a traditional, now non-standard British paper size also called English folio. This quality of paper is for manuscripts only and not for typing. For typing, ordinary paper was used. Osho was writing with his Parker pen in various colours of ink (also Parker): Royal blue, blue, black and green and most rarely in red ink (No.14). His preference was Royal blue and black ink. He wrote left-handed, and with his special parallel finger holding of the pen. What seems to be the case, is that he was ambidextrous and capable of writing effortlessly with any hand he might choose, with a predominance later on of writing with his right hand. The Parker pen had, among other utensils, like his Olympia typewriter, been presented to him by his friend Parikh in 1960. The manuscripts preserved in Acharya Rajneesh's handwriting are covering the whole of the 1960s. They are numbering a total of 477 sheets, of which 42 sheets are written also on the reverse page. Most of the discourse material has by now been published in books. English words are occasionally added in brackets on his manuscripts. And the markings are having an R for recto, front page, and an V for verso, reverse page. "I can guarantee the authenticity of these documents. When I took admission in medical college, Jabalpur in the early 70s there was a waiting period to get a room in the hostel, therefore I had to stay at Arvind's home for about 6 weeks. He used to publish the YUKRAND magazine. At that time the printing press was within part of his house extension. I used to spend 1-2 hours daily helping in the press office. It was a great opportunity to enjoy proof reading, matching the print matter with the original.,Thus I have gone through all these files of manuscripts. I knew that in names of Kranti, Arvind, Aklank, Ramaa and others everything is written by Osho himself. The preface is written by Osho, credit given to someone else. During his school days Osho made a booklet named PRAYAS. Niklank had a habit of preserving everything written by Osho, even the papers thrown in dustbin. Niklank decided to preserve only those pages from this booklet which contained articles by Osho, and discard the remaining articles written by other students. Later on he came to know from Osho's friends that all articles were written by Osho only. It is published in the book NAYE SANKET: "A compilation of notes taken by many friends during discourses and discussions". Even that is not true. All 223 notes are written by Osho. There was a clear instruction for editors, not to change a single word. Keep it exactly 100% as it is. As far as I know, nothing has been changed till now. These books- Kuchh Jyotirmaya Kshan, Naye Sanket, Kranti Beej, Mitti Ke Diye, Path Ke Pradeep, Kranti Sutra, Sadhana Path, few chapters of Main Kahata Aankhan Dekhi, Sinhnaad, Path Ki Khoj, Naye Manushya Ke Janm Ki Disha, Dharm aur Vigyan, & many books having compilations of letters, are hand written. Osho's original letters published in Path Ke Pradeep and Kranti Beej are still available with the family members of Ma Sohan and Sw Manik Bafana (both of them passed away) at Poona. You may verify with them. Ma Sohan and Sw Manik must have shown photocopies of these letters to thousands of sannyasins who visited them. Ma Dharm Jyoti, Sw Chaitanya Keerti, Sw Satya Vedant, Ma Neelam, Sw Tathagat and almost all Indian sannyasins living in Poona at that time, plus many foreigners too, must have seen these letters. Sohan had a habit of inviting people for lunch or dinner almost 2-3 times a week." Osho Letter written on 12 Feb 1967 - to unknown: "Don't Ask Me to Write"
Please note that all manuscripts displayed here are copyrighted and are not part of the usual GNU Free Documentation License of this wiki. Timeline information found in some of Osho's manuscripts.